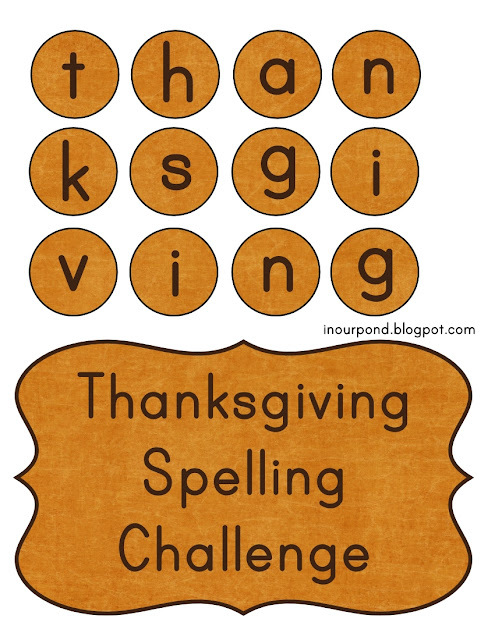 It's Thanksgiving Week! 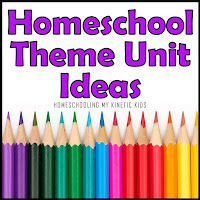 I had a bunch of activities planned, but our week didn't go as planned at all! We're sick again and Daddy came home sick today so we didn't get any Mommy School done. Instead, I spent a few hours packing and sorting things from our upcoming move. Today was our first snowfall of the year. 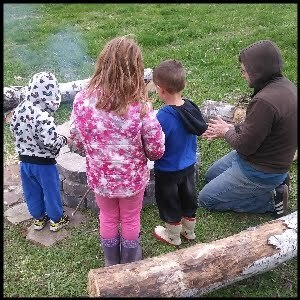 The kids spent most of the day running around outside and taking warm baths. We had a very busy day looking at houses with all three kid and our realtor. 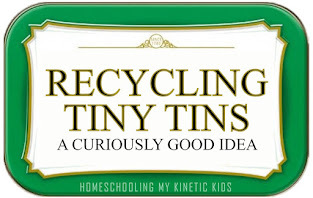 After we got home, we finally did a bit of Mommy School. 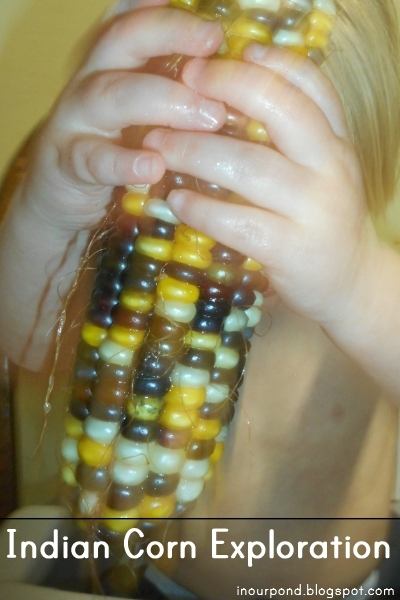 We played with Indian Corn that I had bought at the Farmer's Market this fall. Tadpole loved feeling the corn kernels and pulling on the stray silks. I tried to show him how to pluck the kernels out but he got mad that he couldn't eat them. Dragonfly eagerly took the corn away from her brother. She attempted to pick the kernels out with tweezers, but she decided it was too hard. I think I had the wrong size tweezers for the kernels. 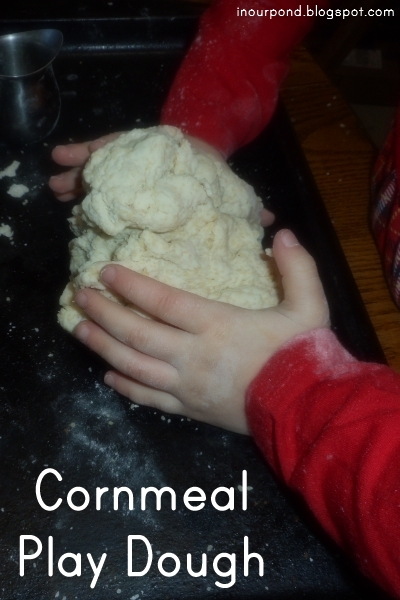 I also made the kids some corn meal play dough. 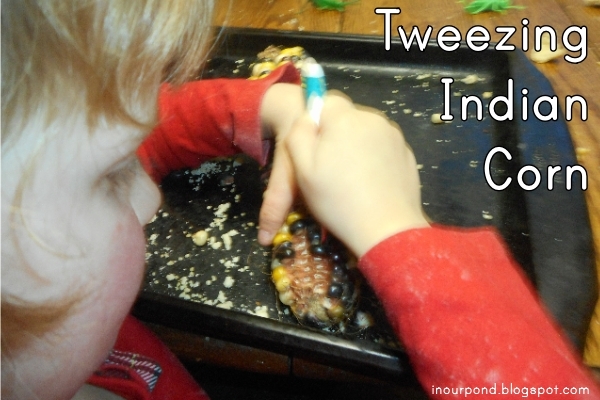 All three kids loved the texture and spent a long time squishing and kneading it. After we were done with our table time, we put the ear of corn in a bowl of water to see if we could get it to sprout. My goal is to show my kids that corn is a seed, since we've sprouted a few other seeds this year. 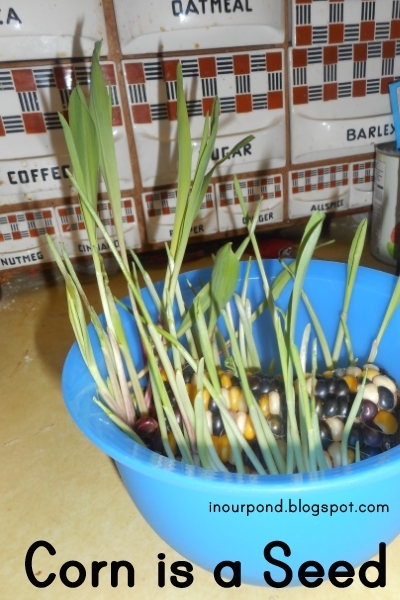 Update (Dec. 10, 2015)- The kids were so surprised to see that the "dead," dried out Indian corn spouted. They excitedly announced, "They're seeds!" 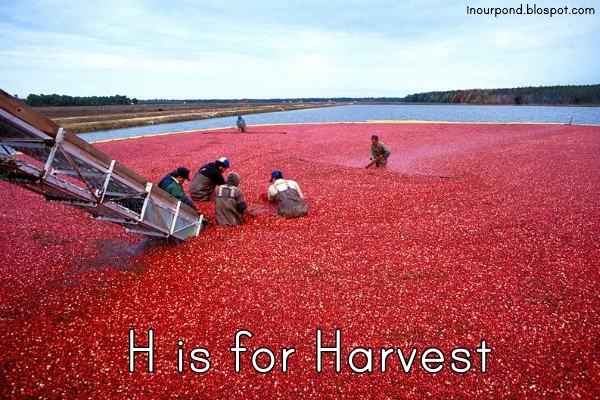 I clicked your post from a linkup because of the cranberry picture (I'm born & raised in California and just learned a couple years ago how cranberries are harvested.) 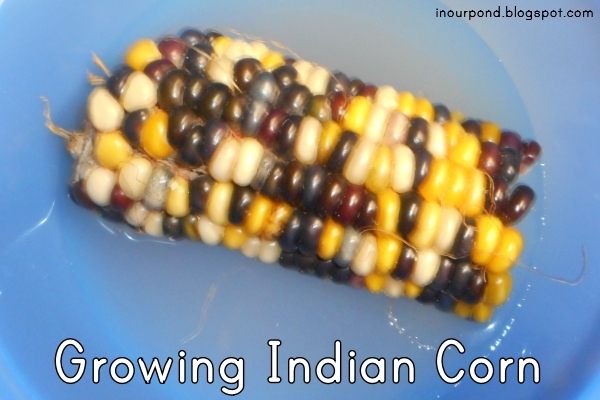 but I'm so glad I read through and found the sprouting Indian corn shot! I would never have thought to just toss an ear into a bowl of water like that. :) Neat! We've had volunteer corn grow under the birdfeeder and in the compost box, but we've never made a stab at sprouting it indoors.